The marathon is fickle. Some days, it’s in love with you. It caresses you mile after mile; whispering sweetly in your ear and sending shivers of pleasure down your spine. These are the days that linger in your mind on the other days, when the marathon is abusive. On the days when it kicks you squarely in your soul, crushes your confidence, and draws tears. And prepare as you might to ensure it will treat you in the former manner and not the latter, you can never guarantee it. The marathon will always behave as it wants. I went out cautiously, having just shed the cheap teal, velour blanket I’d held wrapped around my my waist since departing the warmth of my car for my start corral, thirty minutes prior. At below 40 degrees, the air threatened to seize my already fragile legs. This was my fourth race in four days, sixth race in nine days, and the culmination of a 67-mile training week. The marathon’s patience with me already seemed thin. I bided my time through 10k, maintaining a comfortable pace, even stopping to use the bathroom. See, I showed it, this race doesn’t matter to me. I’m not trying to do anything here. So too through the half, when on other days I would have begun imposing my will on it. I didn’t trust that the marathon wasn’t just lulling me into a false sense of security. It’s dominance was already becoming evident around me, as those who were compliant gave in quickly to its ire and began walking, while others grimaced in their refusal to succumb, now with 8 miles remaining. At 20 miles, I remained docile, my October Chicago Marathon still fresh in my mind. I’d lost minutes in miles 20 through 23 when the marathon decided, with just a 10k left to go, that it would let me break my own personal record, but not by as much as I’d wanted to. It was 24 miles by the time I trusted it enough to push. What can you possibly do to me in 2.2 miles? I asked it, rhetorically. I crossed the finish line just 3 minutes and 15 seconds off my personal record, a “second-best” time by four minutes. Could I have found the 3 minutes and 15 seconds over 26.2 miles to give me a personal record? I don’t know. I don’t think the marathon loved me yesterday, I think it just wanted to pay me a complement. 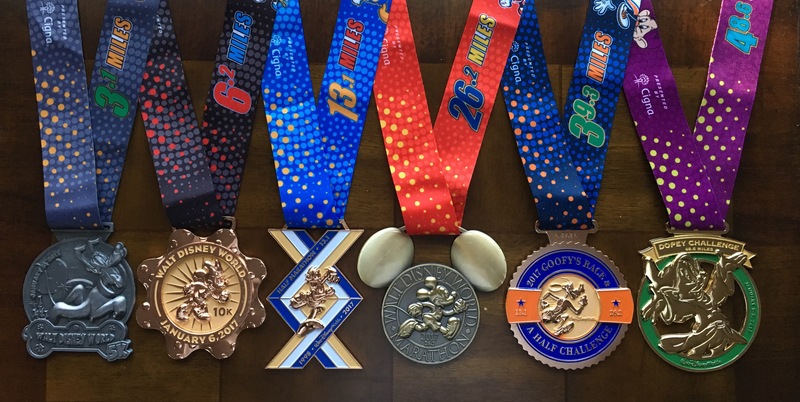 Medals for the Walt Disney World 5k, 10k, half marathon (which was officially cancelled due to weather, but that some, including myself, ran anyway), marathon, Goofy Challenge (half and full marathons), and Dopey Challenge (5k, 10k, half and full). You are inspiring… I am enjoying reading about your 40 bibs! So much fun! Thank you for following Karen! I’m planning on doing the Dopey Challenge in 2018. Would you mind if I used your medal photo to show what they looked like in a post of mine? I will credit you in the photo and link it back to your blog. 🙂 Please let me know if that’s alright. Absolutely! Thanks for following, and good luck on your 2018 Dopey quest!